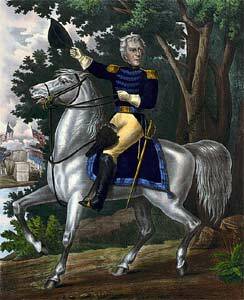 Andrew Jackson with the Tennessee forces on the Hickory Grounds, 1814. Lithograph published by William Smith between 1834 and 1845. Library of Congress, Prints and Photographs Division,LC-USZC4-4084. For a generation of Americans, Andrew Jackson became the living embodiment of the country's frontier values. Born in South Carolina to Irish immigrants, he served in the Revolutionary War at age 13, became a frontier lawyer in his 20s, and a military hero of world renown in his 30s. Like his political predecessor Thomas Jefferson, he was a paradoxical figure. Jackson became known as a man of the people, yet he owned one of the largest plantations in Tennessee. He was staunchly pro-slavery and pro-states' rights, yet his equally strong stance in favor of the Union led him to defy his most militant southern allies. Though he was a stern militarist, he coddled his only adopted son to the point of ruin. A great democrat, he could also be a great autocrat, flaunting constitutional law as a general and president. His contradictions may have been the secret of his political appeal. Whatever the cause, he remains one of the most influential figures in American history, the man who united southern populism and Northern labor to give birth to the Democratic Party.